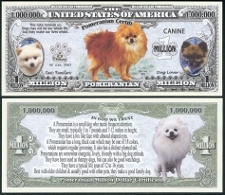 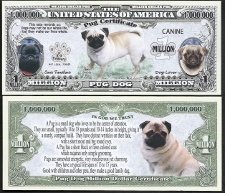 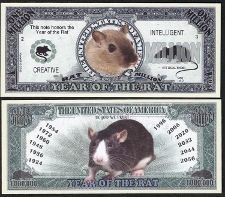 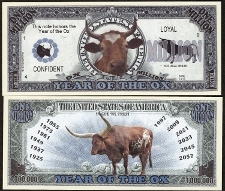 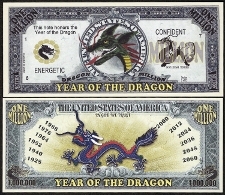 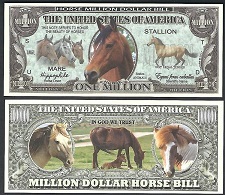 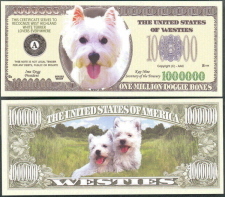 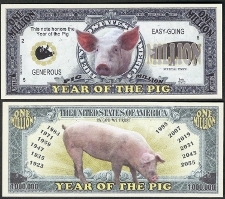 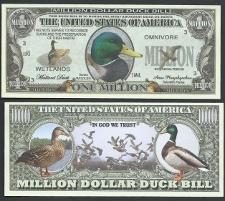 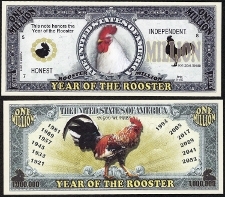 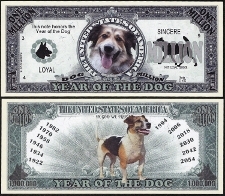 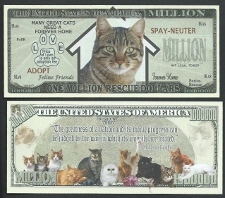 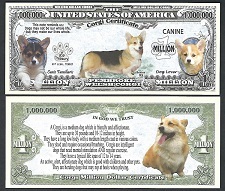 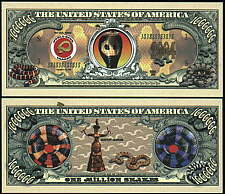 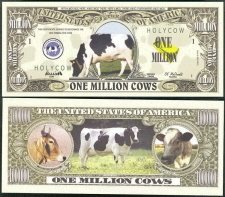 To see Enlarged picture of this bill click HERE!!! 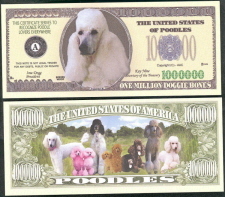 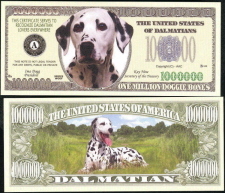 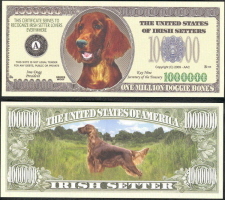 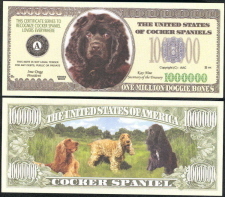 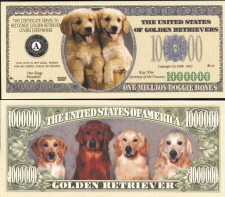 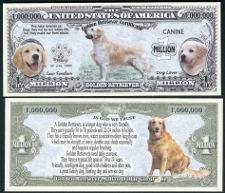 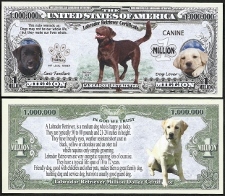 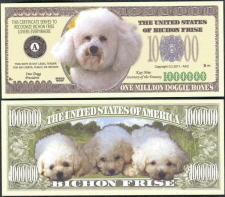 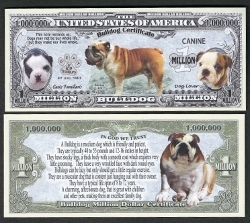 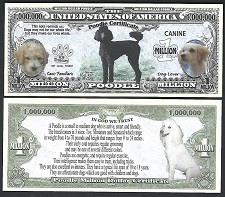 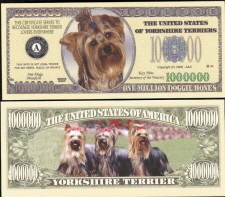 One Million Doggie bones featuring the Cocker Spaniel. 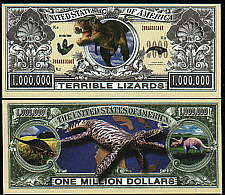 T-Rex Terrible Lizard and Jurrasic Friends! 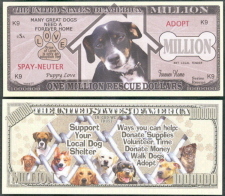 Support your local dog shelter. 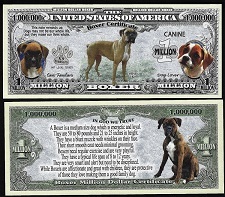 Many great dogs need a forever home. 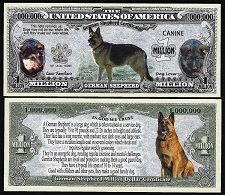 Man's Best Friend Under the Sea! 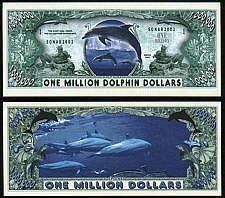 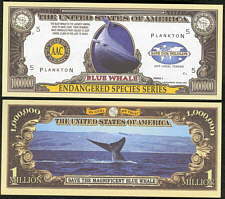 Blue Whale is the largest animal to ever have lived.SALES OF THIS BILL SUPPPORTS THE NATIONAL WILDLIFE FEDERATION...10% of the price we pay for these is being donated to the National Wildlife Federation every time we order & re-order these bills!! 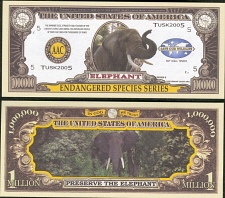 The Elephant is the largest living land animal.SALES OF THIS BILL SUPPPORTS THE NATIONAL WILDLIFE FEDERATION...10% of the price we pay for these is being donated to the National Wildlife Federation every time we order & re-order these bills!! 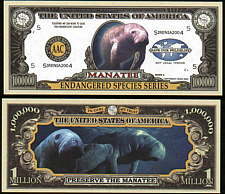 Save the Manatee, when boating, know where to go slow!! 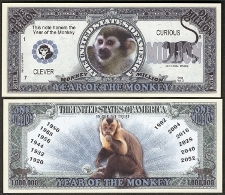 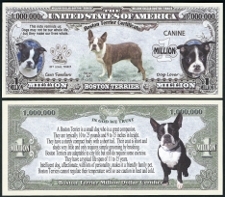 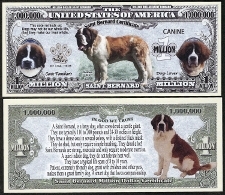 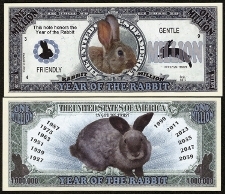 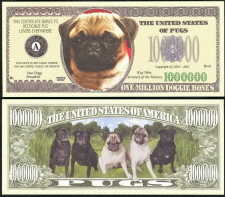 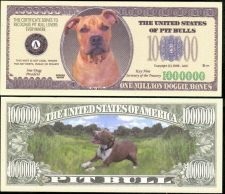 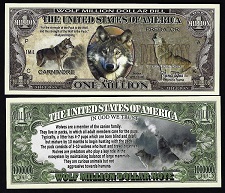 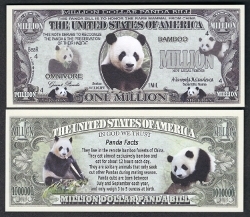 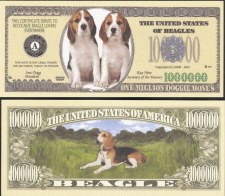 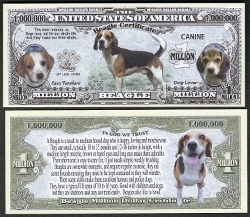 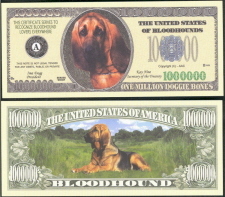 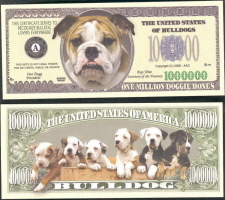 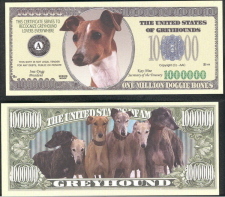 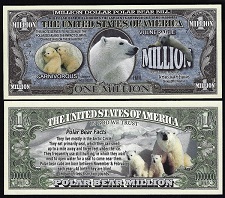 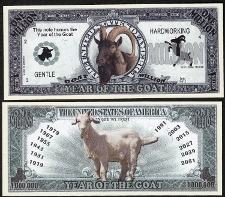 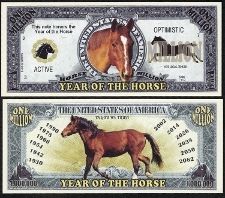 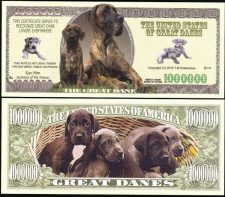 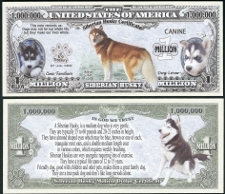 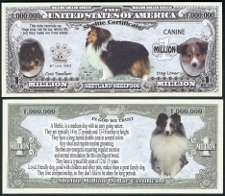 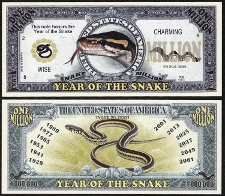 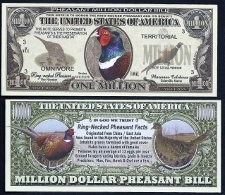 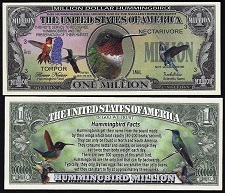 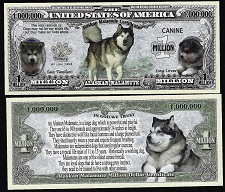 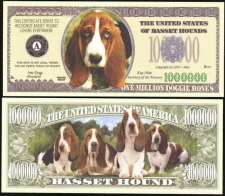 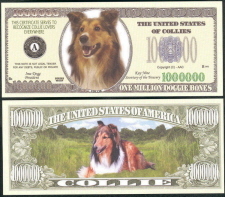 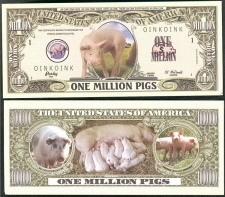 SALES OF THIS BILL SUPPPORTS THE NATIONAL WILDLIFE FEDERATION...10% of the price we pay for these is being donated to the National Wildlife Federation every time we order & re-order these bills!! 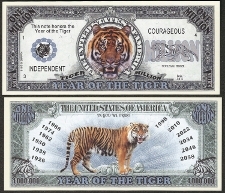 First of the Endangered Species Series, The Bengal Tiger!! 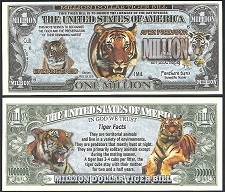 Save the Tiger!! 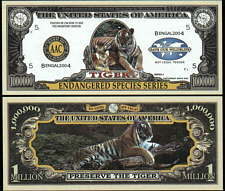 SALES OF THIS BILL SUPPPORTS THE NATIONAL WILDLIFE FEDERATION...10% of the price we pay for these is being donated to the National Wildlife Federation every time we order & re-order these bills!! 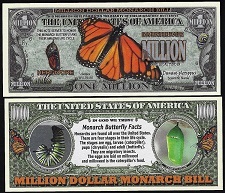 Colorful Million Dollar Frog Bill! 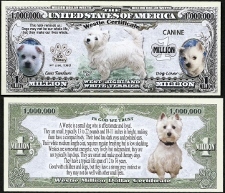 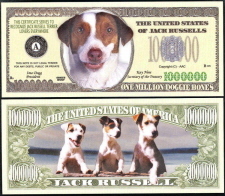 One Million Doggie bones featuring the Jack Russell. 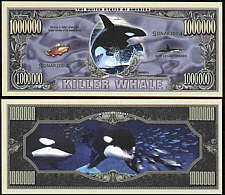 Sonar....The Killer Whale also know as the Orca Whale, is the Largest Member of the Dolphin Family!! 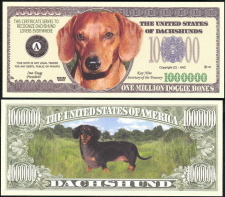 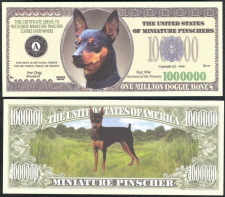 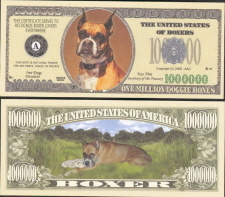 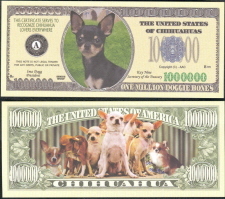 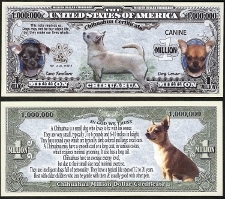 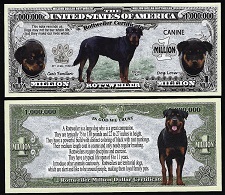 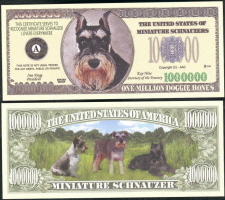 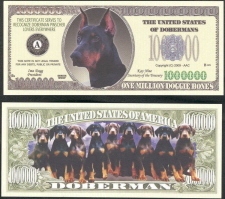 One Million Doggie bones featuring the Mini Pinscher. 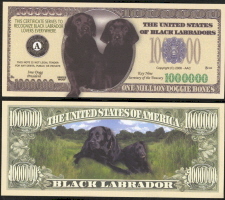 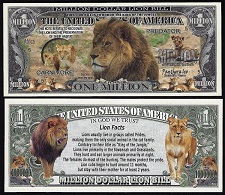 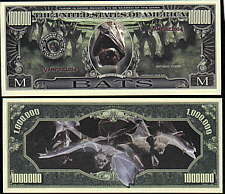 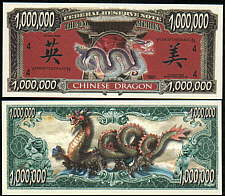 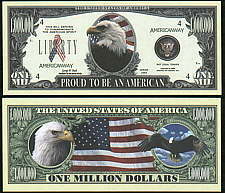 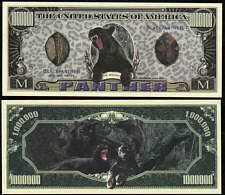 Black Panther/Big Cat Million Dollar Bill!! 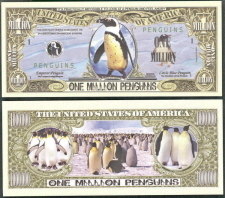 This certificate serves to recognize the sphenisciformes, spheniscidae (Penguin). 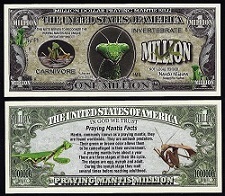 This note serves to recognize the Praying Mantis as a unique predatory insect. 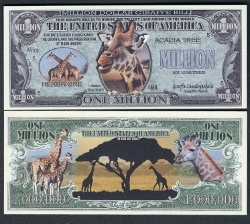 African Wildlife, with Elephant, Zebra, Rhino, Giraffe & Bird!